Mrs Lawson was usually in the shop but there was a Mr Lawson who seemed to stay in the ‘back shop’ (I think he was disabled or just old). I believe they were (or had been) Methodists; they gave me some books of Methodist interest which I eventually gave to Newcastle City Library – I hope they are still there! 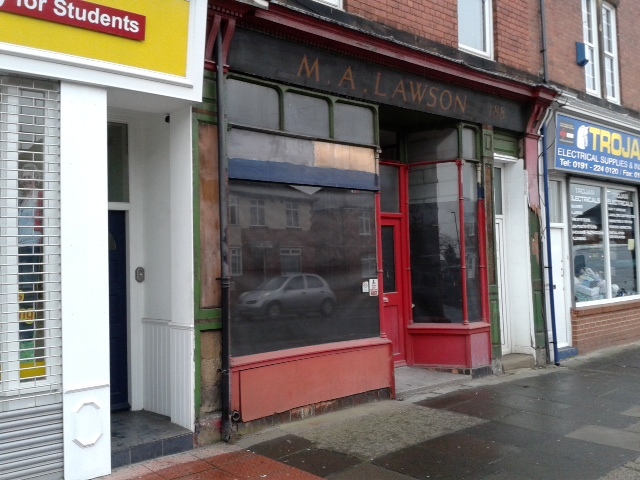 I was interested in seeing your article on 188 Chillingham Road re Margaret Lawson. I have been doing my family tree and while I cannot find a direct link I have come across a Jas Lawson Fruiterer & Greengrocer, Potato Merchant at 69 Shield Street, Shieldfield, Newcastle upon Tyne in 1885. I realise Shieldfield is not part of Heaton but would love to know if there was any connection. I have just come across an entry in http://www.curiousfox.com of someone seeking information of a William Lawson Fruiterer. Could he have been Mrs Lawsons husband. He was a Robertthough, wasn’t he?